Posted on June 12, 2016 by revivewa	in Opinion, Reviews. When Spotlight won the Best Picture Oscar many people had never even heard of it. Spotlight is based on the true story of a group of journalists who risked their careers to prove the institutional cover up of endemic child abuse by Catholic priests in Boston, USA. This film manages to quietly convey the emotional reality of a situation that is not just contained in history but has been playing out in cities across the world. However, there is no sensationalist edge to it, just the determination of a few to bring justice to many. There is a deep emotional heart to Spotlight that connects sincerely with its viewers. The portrayals of the survivors of abuse are diverse and sensitively performed. Rather than having standout performances that stick in your mind, this film manages a standout corporate performance, where the entire cast works so well together that they make reality happen on the screen in front of you. I expected Spotlight to be hard to watch, it wasn’t. Where the very topic of child abuse can leave a sour taste in the mouth, Spotlight inspires courage and a desire for justice. 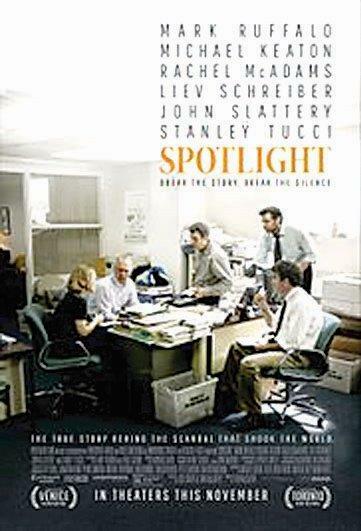 Spotlight was released on 4 May on DVD, Blu-Ray and Digital.